As a late Christmas present, I found this Odhner 35 in Sweden. 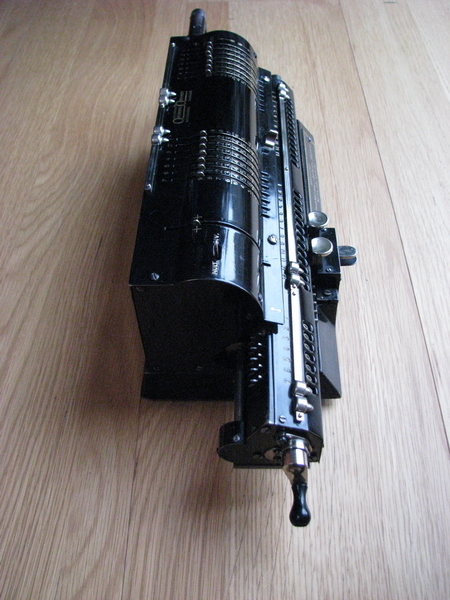 Originally, it came from the Swedish army, and was in a warehouse in Tingstäde. 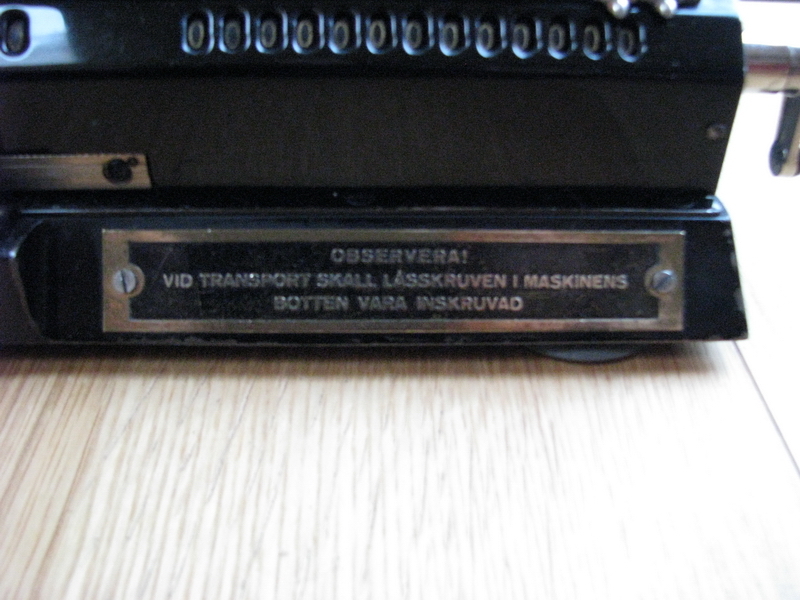 (Incidentally, the Swedish army has kept the oddest things ... see here). These machines were used for ballistics calculations. The technical officer charged with reducing army stockpiles in 1987 came across two of these sat on a shelf. They were no longer in the ordinary inventory and should hence have been thrown away. Luckily this didn't happen, and eventually one of them found its way to my collection. 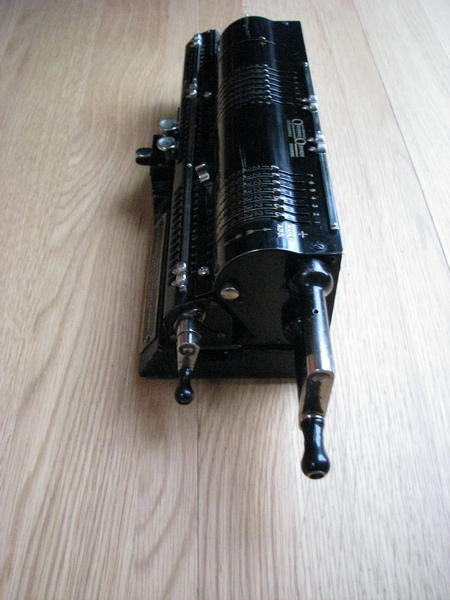 There was another of these for sale at the same time from a different seller, with serial N° 183xxx, which I didn't pursue any further since I already bought this one - but when this machine arrived I could kick myself that I didn't. Why will be explained below. 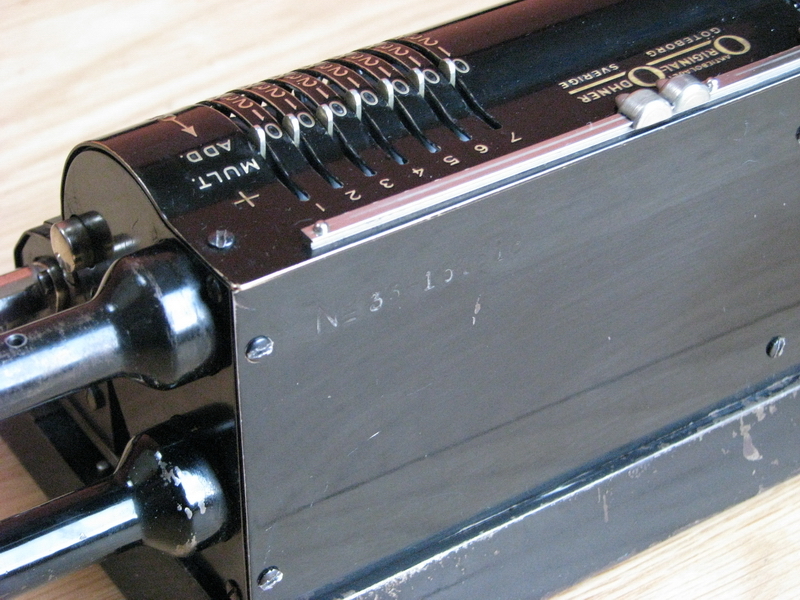 The Odhner 35 was the second version of the Odhner geodetic calculator - the first one was constructed in 1930, based on the Odhner 16, with its oddly shaped input control register. Those are exceedingly rare. In 1939, Odhner made this version. There is some literature about them, e.g. on rechnerlexikon, which depicts a version with 7+7 x 7 x 13 positions. Pictures of machines show a version with 8+8 x 8 x 13 positions, so it turns out there are two versions of the model 35, with different capacities, which are in effect different machines, but they have the same model number, 35. The 8+8 x 8 x 13 version seems to be the later variant, with serial numbers in the 180xxx range - and sure enough, the other machine for sale was the "big" version, and I didn't notice at the time. Now onwards to the machine itself. As described already in the page on the Odhner 135, Odhner used its own system to make calculation with complements possible. 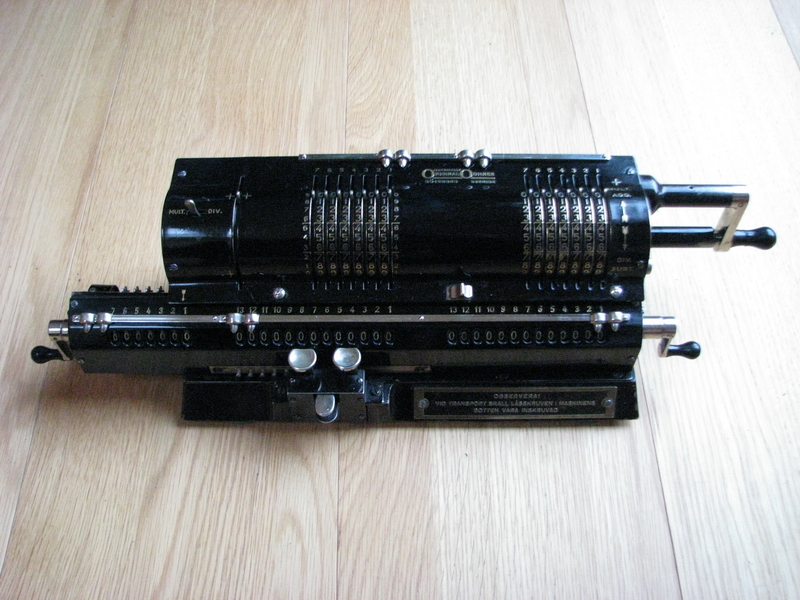 Other manufacturers made the twin machines rotate in different directions for +/- calculations, Odhner did not do this, but added a special pin on the left machine, which operated 5 (in the machine with capacity 8), or in this case, 6 extra pinwheels, in order to carry the leading digit out of the register and thus work with complements error-free. Of course since this was only done on the left machine, it required the operator to remember not just which of the machines was supposed to go negative, then crank in CCW direction if necessary, and then possibly change signs afterwards. Sometimes it may also have been easier to switch x and y coordinates. Especially for continuing the calculation afterwards, it is easy to see why all of this this would have caused complete chaos, which is why Odhner expanded the use of complements to both machines in the Odhner 135, but this was too little too late - the market for geodetic calculators had been thoroughly saturated by Brunsviga at that point. This particular machine arrived in spectacularly good order, but as usual with machines dating back to the 1930s, covered in nicotine and tar deposits. The machine had also been oiled profusely, unfortunately with a kind of oil that turns to glue, which seems to be particular to world war 2, and some of it had gotten on and into the pinwheels. This is obviously bad for them, because they get stiff and sticky, but if you have one setting pin that has to operate six pinwheels, it is nothing short of deadly. So I took the machine apart and washed the pinwheel cylinders with copious amounts of acetone. Luckily, the wheels for the tens complement calculations did indeed free up when faced with that treatment. Then came the long and frustrating business of getting the left end of an Odhner with tens carry in the counter register back together. Since there are plenty of interlocks, all of which kick in when any of the gears is off by a tooth, finding the correct positions is a bit of a problem - marking the gears helps, but just knowing how they should go is not a sufficient condition to actually get them there - there are five gears which need to mesh correctly, one of which is at the back of the carriage, and hence more or less "out of control". 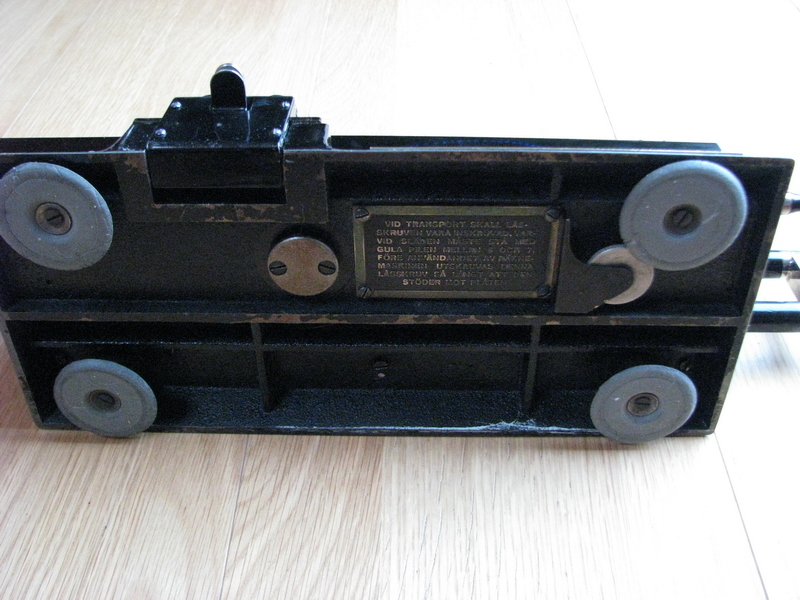 In addition, the direction switch for the carriage (the mult/div lever) requires nothing short of black magic, as well as six hands, to reassemble correctly. But I did manage, and the machine now works. It is beautiful as well as rare, and I am happy! "During transport, the locking screw must be screwed in, with the carriage positioned with the yellow arrow at position 6 or 7. 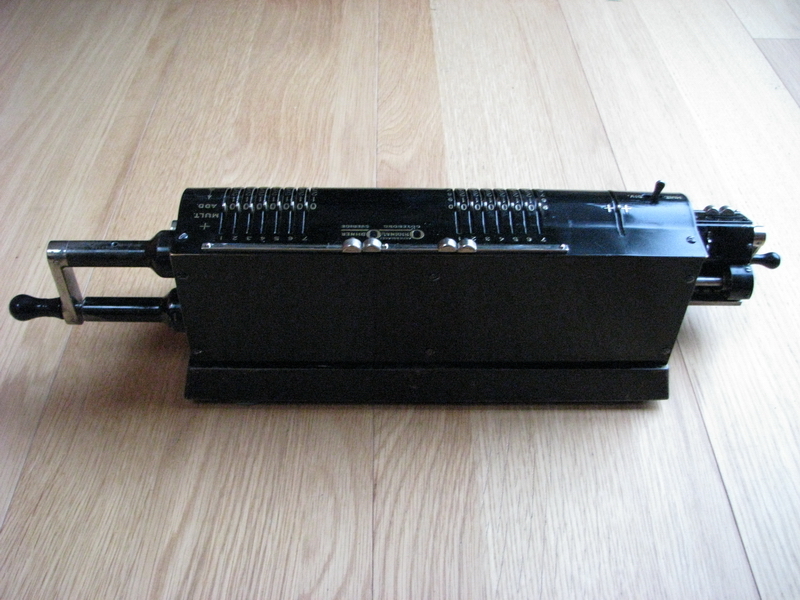 Before the caclulator is used, this locking screw must be unscrewed until it hits its stop". The thumbscrew in question can be seen between this sign and the front right foot of the machine. 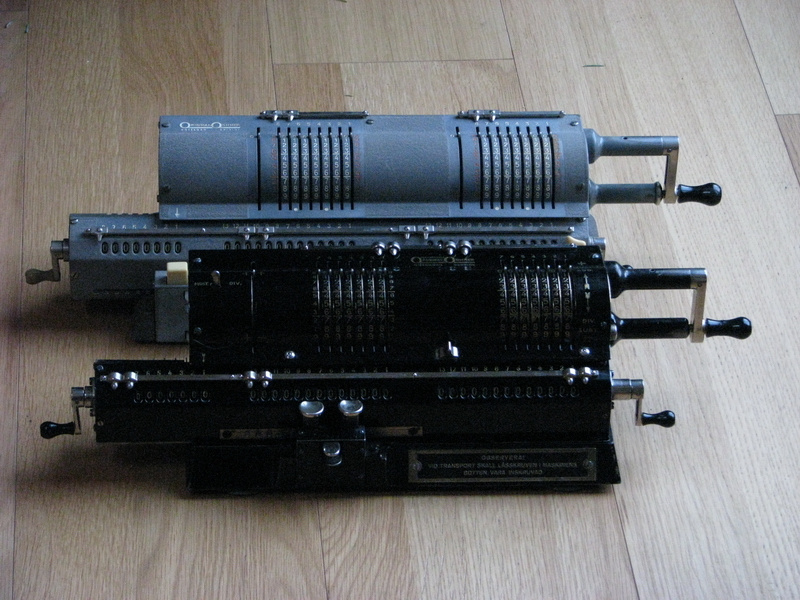 And a family picture - note how the 135 is noticeably wider - and how in the Odhner 35 the extra pin for tens complements is placed at the end of the pinwheel cylinder, whereas in the 135 it sits next to the "regular" pins. Three of the "extra" pinwheels in the 35 are made of brass as opposed to the zinc compound that the rest consists of - perhaps for reasons of reducing friction - but the tens complement pin is heavy to operate regardless.